My Ladys says seein’ one of her furbabies hurt is quite upsettin’!. When one of us gets hurt she gets a might upset. One of us yelpin’ in pain is enough to make my Lady come a runnin’! With 7 of us here, we’ve had our share our accidents, mostly sprained legs from steppin’ in them holes them pups keep a diggin’! When accidents happen, there are some things ya can do to make the whole situation a lot better though. We thought we’d give ya few tips on how to handle an injured pet. Sometimes it may be a simple sprain, but your pet is a howling in pain! On the other hand, if it appears your pet is hurt bad from getting hit by a car or another accident, it means you need to call the vet immediately. Most importantly, you need to STAY CALM! Getting crazy and upset will not help your pet! Stay with your pet as you call the vet. They may need to walk you through some things to see what is hurt. Try not to move your pet until after you talk to the vet. Anytime a pet is injured, it’s very important to be very gentle. You can never be gentle enough when it comes to handling anything that’s injured, especially a pet. A couple of tips for being gentle include asking for help if needed. Don’t try to move a pet by yourself if you’re not able. Also, remember that the pet is injured, so they may be a little extra sensitive. While helping your pet, you may want to hug him, or her, but this could cause your pet even more pain. So, save that hug for later! Some pets get very upset, cranky, and downright snappy when they’re hurt! Pain can make them lash out! For the sake of safety, you may need to muzzle them. If you don’t have a muzzle, you can use a strip of gauze, or cloth, and tie it around their snout. Only muzzle if it’s necessary. Keep in mind that if your pet is vomiting you shouldn’t muzzle them at all. The size of the pet doesn’t matter when it comes to muzzling. Even little dogs can get extremely upset and snappy when injured and will lash out with a bite. Also, you don’t want your face right up there close to their snout where you may be bitten in the face! Dogs don’t mean to hurt you, but their pain may cause even the most devoted pet to lash out! Experts recommend keeping an injured pet to a small area of the vehicle when they are injured. Vehicles move, bump, and jolt around and you don’t want your pet to get injured even more! The best way to do this is by using a box or travel carrier, for small pets. For larger animals that won’t fit into carriers, you can lay a few towels down and do your best to keep them in a small area of the vehicle. If your pet needs to be lifted, and they are a large dog, make a makeshift lift with a sheet or large towel. You will need help in lifting from the ends, but this will make it easier on your pet. Don’t ever feel embarrassed to ask your vet as many questions as you want. Dealing with an injured pet can be a very scary thing! That’s why it’s important to ask as many questions as you need. My vet will vouch that I ask a ton of questions! I want to make sure I understand completely. If you are overly upset or emotional, it may help if you bring along a friend to help you deal with the situation. Having an injured pet is as shocking as seeing a child or friend injured, so don’t feel guilty for caring about your pet or asking questions! For all pet owners, I would recommend having a pet emergency kit available. Do you have any tips to add to the list? I am glad to find an article on pet care because we have no idea how or when they need serious care and I love my baby so much. 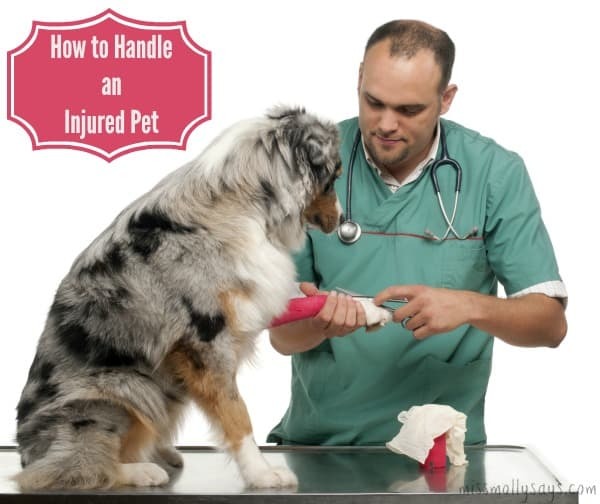 Thank you for the helpful tips on how to handle an injured pet. I only hope I never have to use them. Great article. It is so hard to determine if you should take your little fur family to the vet after an injury. We had to transport my cat to the emergency vet one night. He was in such pain, he was screaming. Since it was nearly midnight we had to go to an emergency vet that was nearly 30 miles away. It was horrible. Luckily my husband was able to hold the kitty, while I drove. Thank you for giving such great tips. Although nothing could have made that less horrible, being more prepared could have saved some valuable time. Very good tips and ideas for fido, thanks! Great information to know with having 4 cats and 3 dogs you want to be able to help them in an emergency situations . I always call the vet or the emergency by my home if something happens rather be safe than sorry if something happens with them. These are really great and important tips for handling an injured pet. These are all great tips! If it’s a cut or would that you need to stop the bleeding for make a quick paste of flour and water. My mom used to accidentally cut the dogs nails too short and that was always what she did. It’s safe if they lick it, or you can put a sock on the paw if that is where the wound is.